Saratoga Springs Politics – Page 111 – Probing Politics Affecting Saratoga Springs. By John Kaufmann. First, an admission. My late mother was her club’s women’s golf champion for decades. I did not get any of her golf genes. For me to play this game would require fairways with containment walls and very large holes in which to sink puts. In spite of this, I hold no grudge against the sport. As part of my research into Saratoga National Golf Course, I secured copies of the two easement documents that they executed in order to get approval for their course. The agreements were with Saratoga P.L.A.N. In order to serve my readers, I decided to go out to the golf course and walk the trails. My first problem was that I could not find either trail. I drove to the parking lot at the clubhouse and using the easement agreement maps attempted to locate the trails. My difficulties began with the fact that there is no obvious signage. Exacerbating the problem was the fact that none of the tees have any identifiers telling you which one they are. Speaking to a friendly father and son, I learned that the golf carts that players are required to use, have GPS systems in them that show you where your cart is and display the course including the tee numbers. So after fruitlessly wandering around in the heat, I called Geoff Bourneman who told me he was pretty sure there was a parking area for a trail at the front gate. So I drove back to the front gate and I noticed that slightly to the west there was an old gate and what appeared to be a small sandy parking area. I drove over there and found a small sign and several small maps. The maps showed two trails. One trail led east to Lake Lonely. I took this trail first. This trail turned out to be quite lovely. The first half was a bit noisy as it parallels Route 9P but eventually it veers away from the road and the noise. There is a very nice bridge that goes over a stream and I watched a large snapping turtle with very impressive claws, leisurely swimming downstream. The path is very well maintained by the golf course and is level and easy to walk. It runs through the woods so that even though it was a very hot day, it was quite comfortable on the trail. Eventually it ended at a very well maintained platform with benches overlooking Lake Lonely. This is a very easy walk that can be done round trip in less than forty minutes. With this success under my belt, I attempted to find the other path. I noted earlier that I did not get my mother’s golfing genes. I did inherit my father’s lack of a sense of direction. I made a mighty effort to determine where this trail was. At the parking place there was a map and a set of directions which I am including with this post. There were no pamphlets and I tried to use the easement map that I had printed out and annotate it with the directions and the map on the sign. This turned out to be very confusing. As best I could tell, I think that following the agreement that the easement was based on, someone decided to change the actual trail. I tried to reach Maria Trabka, the PLAN executive director but she was not in. This is the map of the west trail. It is only marginally clearer in person then it is in this picture. I tried to get a map of the course from the clubhouse but they did not have any. There is absolutely no signage. As I noted, none of the tees or fairways are marked. 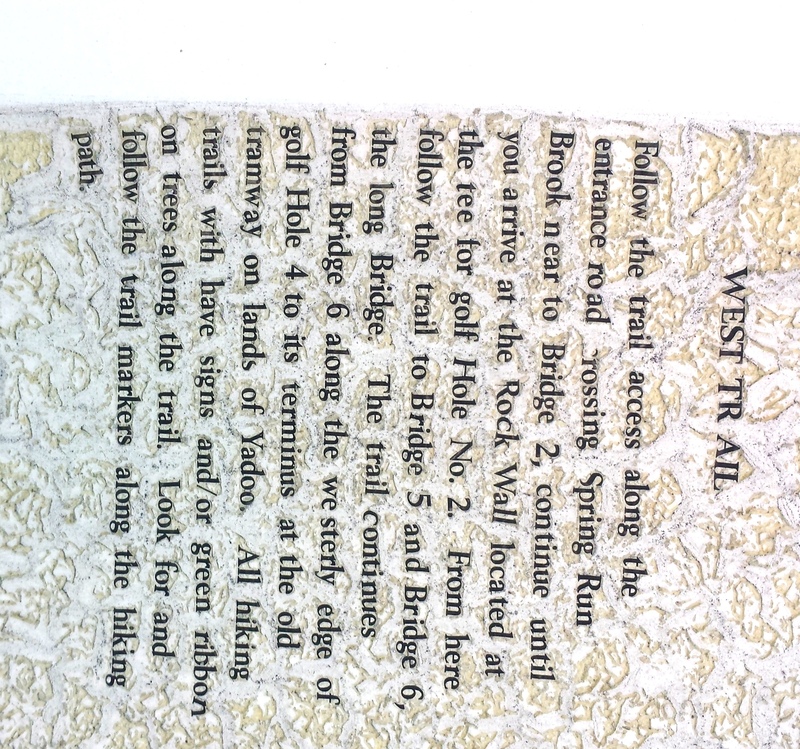 I think the instructions basically have you walking along the golf cart macadam from the gate on 9N to the other end of the golf course where an arrow on the map points to Yaddo. 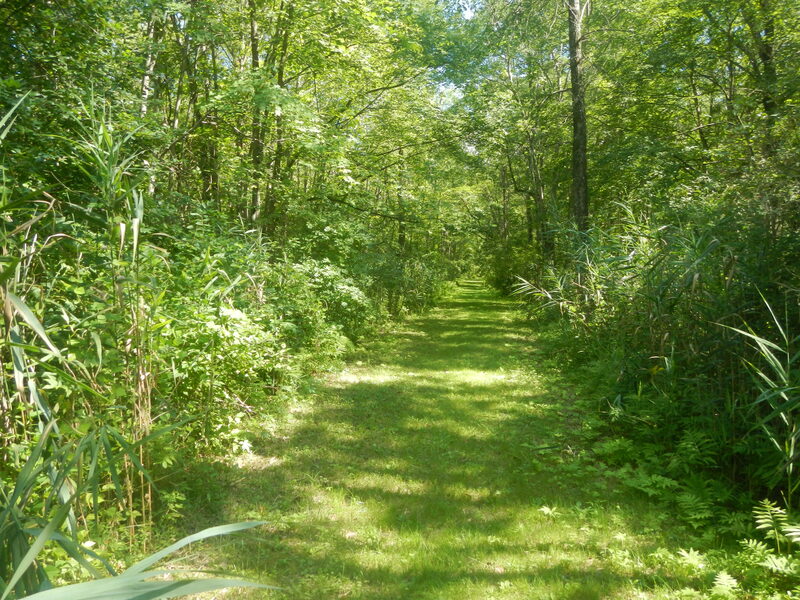 This is made all the more confusing because the easement map calls it a “nature trail.” Most of us do not think of a golf cart road as a nature trail. Eventually, it became quite clear that I was never going to be sure I was on the right trail and I gave up. When I returned to my office, I went on the P.L.A.N. web site and found that the site references the east trail (the lovely one) but there is no reference to the west trail (the mystery one). The easement agreement seems to confirm the right of Saratoga National to change the trail at their discretion. Here is the language. The agreement also seems to include a requirement for proper signage and restrooms. The following language further affirms Saratoga National Golf Course (Grantor) responsibilities to do a proper job of making sure the trails can be found and followed. I assumed that P.L.A.N. was responsible for insuring that Saratoga National Golf Course adhered to this agreement. I will be contacting Ms. Trabka next week to seek clarification on all of this. It is important to note that this easement was critical for Saratoga National Golf Course to win approval to build its golf course. SNGC may have enthusiastically embraced agreeing to the easement but it is clear that they had no choice if they wanted to move forward on the original project. The relationship between P.L.A.N. and SNGC is a complicated one. SNGC had donated $10,000.00 a year to P.L.A.N. If SNGC gets approval to build their resort, they will need P.L.A. N. to be a party to their next easement. I noted in the August 20, 2015 issue of Saratoga Today that P.L.A.N. will be putting on their big annual fundraiser at Saratoga National Golf Course. Twenty business days is the maximum time they have to respond. The twenty days will be up around September 14th. Having been through this issue with the Saratoga Springs Housing Authority, I know that invoices for legal work are covered by the Freedom of Information Law. It should not be much of a challenge to find Schachner’s invoices. Why it should take twenty days is really unclear. The intent of this section is not to prohibit or permit any land use activity but instead to reaffirm that open space values be taken into consideration in development proposals within the Country Overlay Area. For example, a properly designed [ golf ] resort development with sufficient open space and natural resources protection and opportunities for public recreation could provide positive contributions to the City as well as to the long term preservation of the surrounding greenbelt. It is unclear why the word golf is in brackets. Could there be other kinds of resorts? I do not know and I will try to find out. The central issue here is that if, as a majority of the Planning Board asserted, changing the zoning to allow for a resort was consistent with the comprehensive plan, why is there a need to amend the comprehensive plan? This Alice in Wonderland logic is just another example of how tortured this process has been and how much a wealthy and influential player in Saratoga Springs can affect public policy. Basically, a conservation analysis looks at how much land can actually be built on. This analysis would exclude wetlands, stream buffers, land that has sufficient drop to make it not suitable for construction, etc. There are also some other terms involving critical habitat, archeological value, etc. What is left after these lands are excluded in the analysis is referred to as “unconstrained land “(for developers this is the good stuff). It is important to note that the easement of this land is supposed to be perpetual. Michael Toohey droned on at length about the generosity of Saratoga National Golf Course’s support for this change. What he failed to mention is that if this were a proposal for a residential subdivision they would have to do the same analysis and they would be subject to the same limit of building on 50% of the “unconstrained land” just as in SNGC’s resort. There is a significant difference in that the balance of the land in a subdivision would not be required to go into an easement to allow public access. Still, since SNGC cannot use this 50% for development, they are not making any real sacrifice in allowing the public to use it. One outstanding question that still needs to be answered is where the actual golf course fits in. If 50% of the land must go into an easement, would there be enough land other than the golf course and buildings to provide the 50%? I do not know. I will see if I can get answers. I went on the New York State Board of Elections and found the July report for the Saratoga PAC. With a little more work I was able to identify who most of the donors were. One interesting element is that Cliff Van Wagner and Tom Lewis who are on the Saratoga Springs Planning Board gave generously as well as Linda and Michael Toohey. All are involved in the Saratoga National issue. The Tooheys gave a combined total of over $5000.00. I am saddened by this exchange with Michele Madigan. We have had our differences over the years but she was always open and direct in a refreshing way. I invite the readers of this blog to make their own judgments regarding the emails that follow. In my experience, when a politician refuses to seriously engage on an issue and insists that you wait for the vote, it does not bode well. One can only hope that in this case things will be different. I would also draw your attention to our disagreement about the role of Mark Schachner who handles the legal matters regarding land-use law. 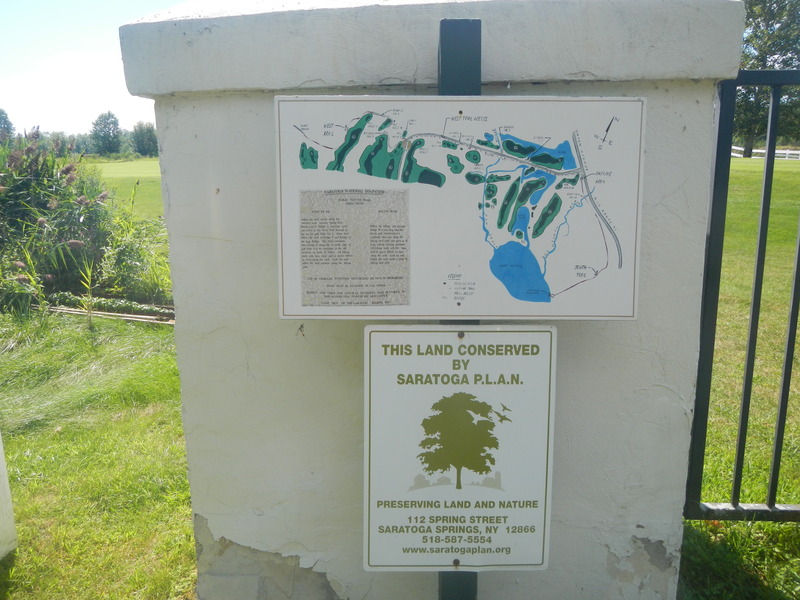 As you know, Saratoga National Golf Course petitioned the city to amend the zoning laws in order to expand their facilities in the city’s greenbelt. The language was drafted by Michael Toohey. Three members of the Council, of which you were one, passed this language on to the Planning Board for their advisement. When the Planning Board met in a workshop to review the text amendment, they dismissed most of it as inconsistent with zoning law. You had previously expressed reservations about the language in Toohey’s amendment. Apparently you decided to meet with Mark Schachner, the lawyer the city uses for land use issues, and asked him to come up with language that could withstand challenge to accomplish what in effect Toohey , the SNGC attorney, could not. At the public expense, Mr. Schachner then crafted new language. Over the thoughtful objections of the Planning Board chairman, the Planning Board adopted Mr. Schachner’s language. They made three changes in the document. They increased the number of stand-alone residences from five to six. They filled in the spaces indicating the amount of land to be set aside for permanent easement to be 50%. They amended the comprehensive plan to allow for a golf resort. You have made previous statements that your support for changing the zoning was contingent on two things. that all but the twenty-five acres on which the construction will take place, must be put into a permanent easement. This would include the golf course. In light of the fact that the document approved by the Planning Board fails to comply with your two requirements, do you expect to vote for or against its adoption. The citizens of Saratoga Springs have a reasonable right to know whether you plan to hold to your promises prior to the night of the meeting. It is important to note that Schachner’s work was critical in coming up with language to effectively save the text amendment. Since he did this at your request, you are now the architect of saving the text amendment and in effect, making it possible for Saratoga National Golf Course to get the change in the city zoning to achieve their goals. I look forward to your answers. John, I think you are confused about the process here. Firstly, your continual mischaracterizations of Mark Schachner’s work on this issue shows a lack of understanding of how our City government works. The Council asked the Planning Board for an advisory opinion; Mark Schachner is the City’s retained legal expert on such matters. It’a only natural that the Planning Board discuss these issues with our attorney versus relying on the legal work of an attorney who represents the interests of a private landowner who may prefer broad and sweeping changes to our Comprehensive Plan and zoning ordinances. Why you would suggest that the Planning Board and the Council should rely on Mike Toohey’s work on and not on our own legal counsel is beyond me. Secondly, I am one of five voting members of our City Council. The City and County Planning Boards do not tell me what I can or cannot vote on, they merely provide advisory opinions. No matter has been brought forward for a vote by the Council, nor will there be on one (sic) Tuesday Aug 18. When an amendment is brought forward for my consideration I will vote accordingly, and my vote will be in line with what I have said – to you, to the public, to anyone – on this matter. I really do not know how much clearer I can be with you. You keep asking the same questions – and asking them prematurely – and I keep giving you the same answer. I am very grateful, and the readers of my blog should appreciate, your willingness to engage on not only this issue but all the issues that the Council must address. One of the things I have always admired about you is your openness and accessibility. You have a history of being one the most open and direct people on the Council. It is for this reason that I am utterly confused that on the issue of this text amendment, which has now been formally sent to the Council from the Planning Board, that you are unwilling to discuss the problems with it, in particular, the issue of whether what they are recommending for an easement is sufficient to meet your requirements. I also do not understand your unwillingness to share your thoughts about whether the Comprehensive Plan should be amended for this. For someone who has always been forthright in discussing your concerns and in educating the community about many public policy issues, I am just lost to understand your reticence to share your analysis on this stuff. We seem to be talking by each other when it comes to Mark Schachner. I have no problem with Mark Schachner offering an opinion to members of the Council or the Planning Board on the legality of what Mark Toohey has put forward for amending the city zoning law. My difficulty is that after Mark Schachner accurately exposed the poverty of Toohey’s language for amending the zoning code, he rewrote it so that it would achieve what Saratoga National Golf Course was seeking in order to make it more legally defensible (I still question whether what he produced is not spot zoning). I do not think that the taxpayers of this city should be paying our attorney to rework Toohey’s botched language. I think the point is fairly obvious. I am a little surprised that you would think that I want you to take Michael Toohey’s advice about anything. As for misspelling your name, you have every right to take me to task for it. I owe you a glass of the wine of your choice as a mea culpa for being so sloppy. On the evening of August 16 Michele texted me to indicate that she was satisfied with her response and that we were talking around each other so there would be no further exchange on this. I just found what will probably be the first of many errors. I used Lake Avenue in the text when it should have read Union Avenue. I have made corrections in the original post. On Tuesday evening the Lincoln Center Chamber Society will be performing an all Russian program. They have announced that persons between the age of twenty-one and thirty-nine will be able to purchase tickets for only $20.00. The pianist Wu Han will be the soloist.